In 2005, the distant Gliese planetary system is discovered to have a potentially habitable planet and a communications array is built by NASA in Hawaii to send a transmission to contact any intelligent life. Meanwhile, Alex Hopper is arrested while attempting to impress Sam Shane. His brother, naval officer Stone, forces Alex to join the U.S. Navy in order to improve his life. 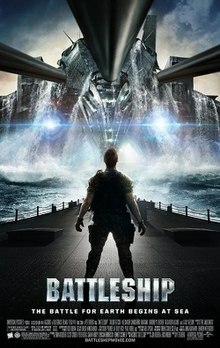 Battleship was to begin filming in Australia's Gold Coast in 2010, but the production company changed location due to a lack of Australian government tax incentives and a high estimated budget of $209 million. Jeremy Renner was originally considered for the role of Hopper, but the actor chose to star in a Paul Thomas Anderson drama filming at roughly the same time. In April 2010, it was reported that Taylor Kitsch had been cast as Alex Hopper, Alexander Skarsgård played his brother Stone Hopper, Brooklyn Decker stars as Sam, Hopper's fiancee and Liam Neeson as Admiral Shane, Sam's father and Hopper's superior officer. Barbadian R&B singer Rihanna makes her acting debut in the film, as a sailor. In an interview with GQ, Berg explained how he came up with the idea to cast her. He realized she could act after her appearance on Saturday Night Live. She accepted the role because she wanted "to do something badass" and also because it wasn't a role too big for her to play.Tadanobu Asano also has a role in the film as the commander of a Japanese Kongō-class destroyer. Double amputee U.S. Army Colonel Gregory Gadson, who had never acted before, plays LTC Mick Canales. He was cast after Berg saw a picture of him in the National Geographic Magazine. The film earned $303,025,485, and only $65,422,625 in North America. With a budget of $209 million the film did not meet its expectations. Metacritic has given the film an average score of 41 out of 100 based on 39 reviews meaning "mixed or average reviews". Rotten Tomatoes gives the film a score of 34% based on reviews from 217 critics, with a rating average of 4.6/10. The site's consensus reads: "It may offer energetic escapism for less demanding filmgoers, but Battleship is too loud, poorly written, and formulaic to justify its expense -- and a lot less fun than its source material." Other critics were less harsh for Battleship: Writing for Time, Steven James Snyder was somewhat positive because he had low expectations of the film. He wrote, "The creative team behind this ocean-bound thriller decided to fill the narrative black hole with a few ingredients all but absent from today’s summer tent poles – namely mystery, nostalgia and a healthy dose of humility" and described it as "an unlikely mix of Independence Day, Pearl Harbor, Jurassic Park and The Hunt for Red October". Giving it a B+ grade, Lisa Schwarzbaum of Entertainment Weekly said, "For every line of howler dialogue that should have been sunk, there's a nice little scene in which humans have to make a difficult decision. For every stretch of generic sci-fi-via-CGI moviemaking, there's a welcome bit of wit." The Washington Post gave the film a three-star rating out of four commenting it is "an invigorating blast of cinematic adrenaline". Roger Ebert of the Chicago Sun-Times gave the film 2½ stars out of 4, praising the climax as "an honest-to-God third act, instead of just settling for nonstop fireballs and explosions, as Bay likes to do. I don't want to spoil it for you. Let's say the Greatest Generation still has the right stuff and leave it at that." ^ John Gaudiosi (May 30, 2012). "$220 Million Battleship Flop Sinks Not Only Universal Pictures, But Activision Game". Forbes. Retrieved December 27, 2014. Universal Pictures reported a $209 million production cost (unadjusted) excluding advertising budget.